Californian Kathee Lavine and South African Anton Ferreira met in 1982 in Hong Kong, where he was a radio journalist and where she soon found work teaching art therapy. A year later they moved to Israel together and lived on a kibbutz for six years. "Our kids JoJo and Jesse were born there," says Lavine. "Anton worked as a vegetarian chef." In 1990 the family relocated to the US and settled in Eugene, where Ferreira launched Holy Cow Foods, making packaged organic products for store shelves. "I call it hippie food," he says. "A real milestone was when we started making roll-ups. We just celebrated the 15th birthday of the original recipe." Originated as a food booth at the Oregon Country Fair, Ferreira and Lavine's Holy Cow Café won the bid for the "healthy food" slot when the UO's Erb Memorial Union installed a food court. "This is our 10th year," says Lavine. 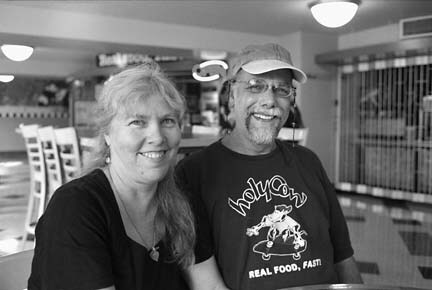 "I think we were the first all-organic food provider on a college campus. We get mentioned in blogs as one of the favorite things about the university."